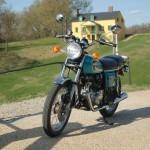 Restored 1975 Honda CB360 Motorcycle. This Honda was restored by its owner. The carburettors were rebuilt and re-jetted with new genuine Honda parts. New genuine Honda intake manifolds were installed. New throttle cables were fitted. The front forks were rebuilt with new seals and dust caps. The steering head was rebuilt with tapered bearings. 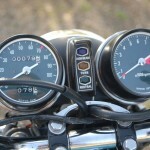 A new old stock speedometer and tachometer was fitted. 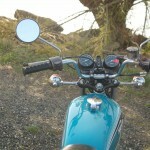 New handlebars, hand grips, mirrors, horn and turn signals were also fitted. 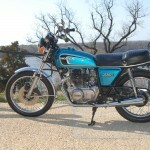 The fuel tank and side covers were professional repainted using acrylic enamel and a three stage process in the original Candy Riviera Blue Metallic. The engine covers and front forks were cleaned and polished to restore the original polished aluminium finish. A new reproduction seat cover was installed. All corroded or missing hardware was replaced with new genuine Honda nuts and bolts. 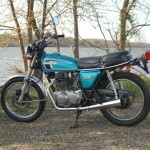 A very nice restored Honda CB360 Motorcycle. 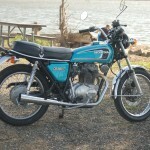 Honda CB360 – 1975 For Sale or Wanted? If you're looking for the perfect Honda CB360 – 1975 for sale then take a look at the hundreds of restored classic motorcycles listed on our extensive Motorcycles For Sale pages. 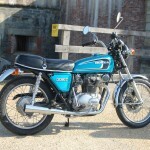 We regularly feature very nice restored Honda CB360 – 1975 bikes for sale. 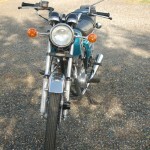 Spares and Parts for your Honda CB360 – 1975? 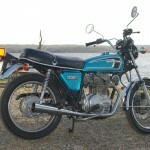 Workshop Manual for your Honda CB360 – 1975?